Flyboarding in the Turks and Caicos. Flyboarding at Leeward Channel in Providenciales. 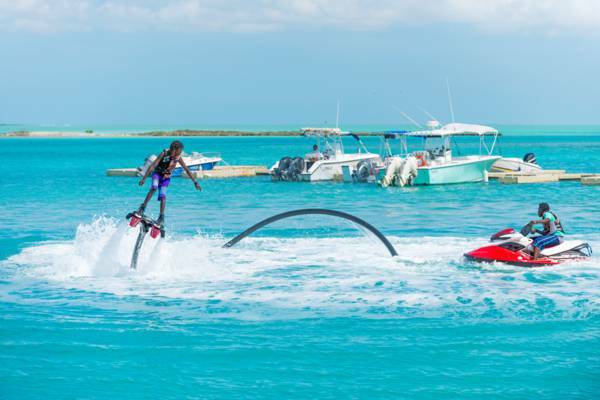 Flyboarding is a new and exciting water sport on Providenciales. This activity offers an unforgettable “jet pack” experience, and allows the user to soar up to 30 feet (9m) above the water. Flyboarding equipment consists of a shoulder, hoverboard, or boot mounted propulsion pack, and is powered by a jet ski’s engine and impellor drive system. The Flyboard essentially diverts the flow of water from the jet ski propulsion system through a hose setup to the pack that the user wears, and the force of this water is sufficient to provide lift to the rider. The guide and instructor monitors the rider and also operates the jet ski, and is able to stop the flow to the flyboard at any time. As is the case with most water sports, a bit of practice is necessary to get the hang of flyboarding, yet most will begin to get the hang of the water sport in 15 minutes. The user is able to control the direction of travel by moving their feet or legs, with tricks such as loops and dives possible. Flyboarding is powered by a jet ski. Leeward Channel, near the Heaving Down Rock area of Providenciales, is the primary spot for flyboarding. This region is quite scenic, and easy to access as well. There’s incredibly turquoise ocean water, lush mangroves, and beautiful yachts around. 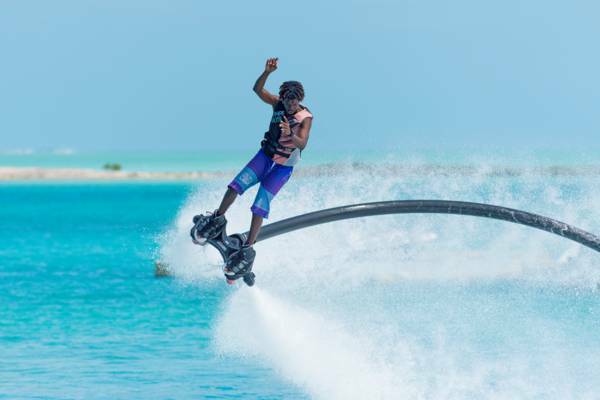 As jet ski use is prohibited in national parks and nature reserves in the Turks and Caicos, flyboarding is not permitted at the popular Grace Bay Beach or the Bight Beach, as these coasts are part of the Princess Alexandra National Park. If you’re staying at one of the spectacular beachfront villas on the south coast of Providenciales, such as Long Bay Beach or Turtle Tail, a private outing outside your accommodation can be arranged, albeit at extra cost. Reservations are necessary for flyboarding in the Turks and Caicos. Flyboarding rates start at about $70 per 10 minutes of flight time. Rate tend to be lower if longer sessions or multiple persons are booked. This water sport is generally suitable for ages 13 and above. Riders should wear a personal floatation device (PFD) and helmet. Discover the best of the Turks and Caicos by jet ski rentals and guided tours. Experience incredible turquoise water, secluded beaches, and uninhabited cays. Last reviewed by an editor on 20 May 2018.